In mid September 2009 a good friend, Anthony Gonsalez, left on a missionary trip to help 200 orphans in Sudan. Conditions there are very rustic. The orphanage shares a hand pumped well with the community . They stand in line to fill buckets and walk them to 55 gallon drums for their daily supply of water. There is no plumbing or electricity. In an effort to make life more bearable for the orphans and staff, Horse Tamer Ministry has joined hands with them by starting a fund to drill a well (they call it a bore hole) in the orphanage compound and install a water storage tank. A solar powered pump will keep the elevated water tank full. The water tower will provide enough pressure and simple plumbing will carry water to key locations. Nothing fancy but it's better than carrying buckets. Sounds simple? It's not! The remoteness and rough roads make this, apparently easy concept, difficult and expensive. So, we're setting a goal of $20,000.00 by this Christmas. Below will be posted an accounting of every cent contributed for this endeavor. Horse Tamer Ministry will spend100% of the contributions for this project. The kids are worth the effort. 1/12/2010 PRAISE GOD!!!!! WE HAVE REACHED OUR GOAL BY COLLECTING $10,000.00 AND RECEIVING A MATCHING GRANT. SEVERAL DONORS CAPTURED THE VISION AND OPENED THEIR HEARTS TO HELP THESE ORPHANS. NOW WE WILL SCHEDULE THE DRILLING. WE WILL KEEP YOU INFORMED OF THE PROGRESS. bible study have been immense anchors for me in Sudan. one’s hands is ignored by most of the kids. gross there are always flies on her head. Treating these children has been a long and exhausting process. Normally, you would treat both infections at least three times a day. handful of available adults to help we can barely do it twice a day. children. We hope that some of them will be cured by then. Being here makes me realize how important health education is. Thoroughly cleaning oneself and maintaining one’s living area is huge. the children with health education. investment into this trip, whether medical, financial, or spiritual. a message and I can give more details. May God's grace abound in your life! March 14,2010 update. Last word is that all the materials have been purchased and a local plumber and electrician are waiting for the pump to arrive. Once the pump is there the drilling crew will do their job. I've been told that in Africa they don't have our sense of time. Things go slower there so we must be patient and pray for God's timing. 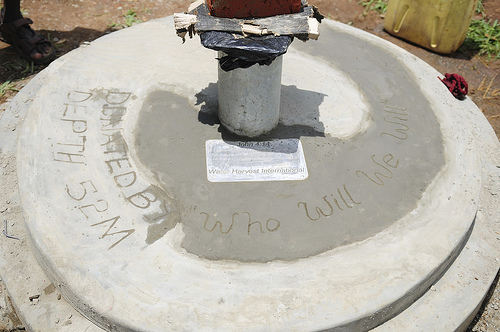 The Water Project at St. Bartholomew’s Orphanage began in January 2010 and is well underway for completion by May 2010. Thank you to all of the people and organizations that have come together, united by the common vision of bettering the quality of life of our children for the glory of God. After securing approval and funding from all the varying partner organizations, communication between CH Global representative and CH Global designated coordinator was already taking place. The initial start-up of the project was greatly aided by the expertise and cooperation of Stephen Huber, of Water Harvest International, who was instrumental in the design and distribution of the structure. Based on favourable recommendations, a local plumber was hired to come on-site and assess the grounds and plumbing materials required for the desired seven water points throughout the orphanage compound. Acquisition of these materials would not have been possible without the generosity of Pastor David Kaya and the First Baptist Church of Kajo Keji, who allowed the use of their drivers and lorry to help purchase and gather the supplies – as indicated by the plumber - in Kampala, Uganda. Items such as a 5000-litre water tank, tubing, piping, fittings, water taps and sinks were purchased from Multiple Industries, Inc. and local hardware stores in Kampala. The lattus (the tower the water tank sits on) is currently being constructed locally, and will be finished at the end of March 2010. 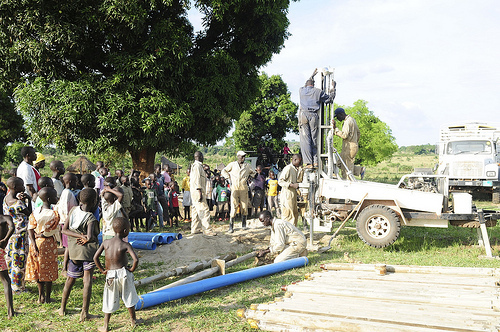 Due to extended time dedicated to the purchase of materials in Kampala, complimented by the busy schedule of Water Harvest International, the drilling of the borehole and installation of the submersible pump will take place at the beginning of April 2010 by Water Harvest International. In accordance with their previous work, this process should take no more than three days. Following the set up of the lattus and water tank, the plumber has estimated one week for his labour. Though solar power at the orphanage is already installed and in-use, a local electrician will visit the compound to ensure that the system is sufficient enough to power running water, and will make improvements as necessary. 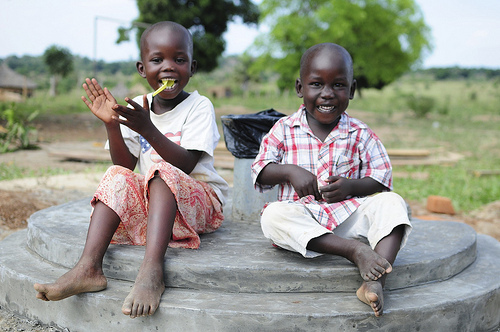 Providing knowledge of the running water yields comfort and empowerment to its users. This education is given in hopes of uniting for an even greater vision: Where do we go from here: How running water will encourage development and self-sustainment for the orphanage compound. 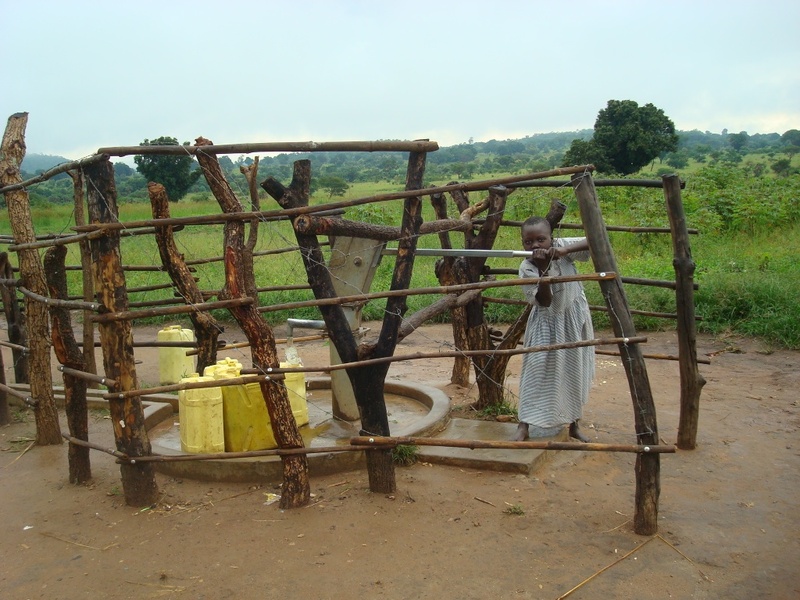 The well has been completed and the electric pump was installed in May 2010.Now we await the 5000 liter water storage tank on a tower, the electrical connection to the solar panels, and the plumbing to seven key buildings. Work is being done by a local plumber and electrician. Praise the Lord!!!!! 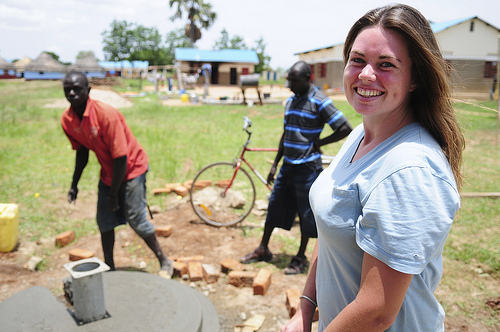 Missionary, Kelly Amsler, rejoicing about the new clean water source.